Ernest Henry Wilks, born in 1889 in Frampton, was the second son of Henry Wilks and Martha née Hazell; his older brother, George John, had died aged just one day, five years earlier. Henry was a waterman, and the family lived close to the canal in Splatt Lane during Ernest's childhood. By 1911 they had moved to one of the cottages at Buckholdt, in The Street, increasing the family's accommodation from four to eight rooms. Ernest was by this time working as a labourer, with Victor William, his younger brother, a fireman or stoker. On 29 August 1914, just after the onset of war, Ernest married Fanny White at St Mary's; one of their witnesses was Henry Elphinstone Guy. 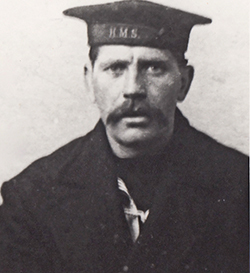 During the war Ernest appears to have served as an able seaman in the Mercantile Marine, despite his appearance in this photograph wearing a hat with 'HMS' on the band (in wartime ships' names did not appear on sailors' hatbands). His record card bears a 1923 statement 'All Naval service Rejected by letter', implying that he had made a claim for such service. Nevertheless, as he qualified for both the British War Medal and Mercantile Marine War Medal he must have made one or more voyages through a danger zone (a definition which would have included all offshore areas of the sea, and also all coastal waters on the south and east coasts of Britain). No records have been found of the ships on which he sailed, or the ports that he visited but his service is commemorated on the plaque in the village hall. Ernest does not appear to have lived in Frampton after the war. Latterly his home was at Brooklyn, Stanley Downton, near Stonehouse, the address given when he was buried in St Mary's churchyard, Frampton, on 17 December 1949.